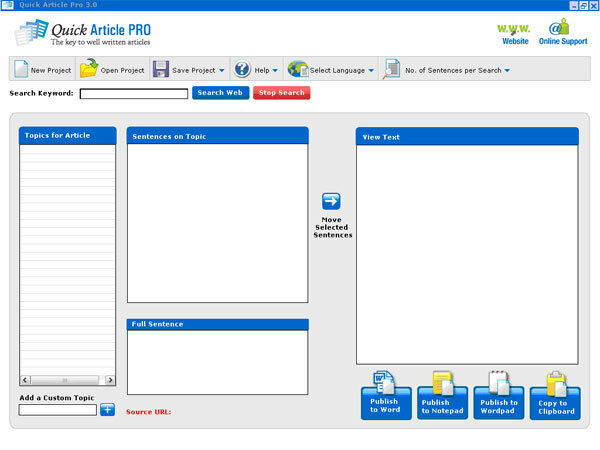 Writing impressive articles has been made easy with Quick Article Pro software. You can generate many quality articles for your work for different categories. Quick Article Pro extracts every sentence that related to the topic or keyword entered by you. Easy article writing software lets you write articles in multiple languages. Once the articles have been generated, you can publish them in Microsoft Word, Notepad, or WordPad. You could even copy the articles to clip board. Writing articles with Quick Article Pro is very easy and saves your precious time. You can get articles of your choice in just 3 simple steps. Enter the keyword for which you want to write the articles, select the results and simply publish them. Get quality SEO articles for your website within minutes.